This 19.6 acre campus is the primary response point for municipal infrastructure design, maintenance and repair for the City of Brampton, Canada’s 9th largest city. The design emphasizes employee well-being and public transparency, and contains three main components; an administrative headquarters, works building, and works yard. The project was built in two phases while accommodating full operations on an existing, partially overlapping works yard site. 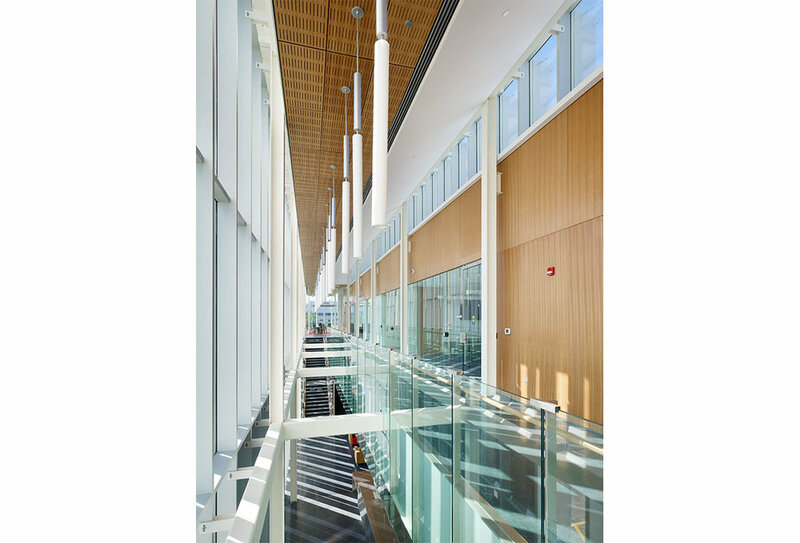 The 190,000 square foot administrative headquarters is LEED Gold certified, and conceived as a collection of crisp glass and metal volumes linked together by a 500 foot long, two storey wood-lined atrium that gestures to the street with a dramatic cantilevered board room. The works building includes the weather event control centre, muster and change facilities, workshops, a fleet repair and maintenance garage, and extensive storage with covered loading. The works yard contains a vehicle wash building, a salt, sand and equipment storage shed, and a fuelling centre.